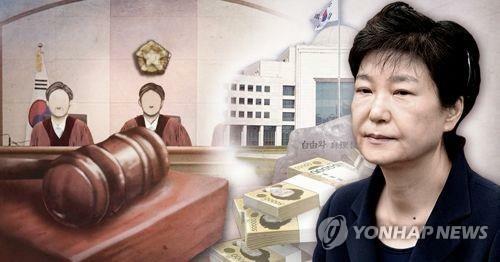 SEOUL, Oct. 1 (Yonhap) — The Supreme Court on Monday decided to extend the detention period of former President Park Geun-hye for another two months, pending the top court’s verdict on her corruption trial. The ousted former South Korean leader has been under presentencing detention since her arrest for multiple corruption charges in late March of last year following the Constitutional Court’s decision to remove her from office. She was convicted and sentenced to 25 years in prison by the Seoul appellate court over an influence-peddling scandal involving her longtime friend, Choi Soon-sil. The Supreme Court’s extension of her detention will place her behind bars until Dec. 16. The court can renew her arrest warrant two more times, meaning she could be detained until April 16 next year. Her detention period was renewed for six more months by the lower court in October last year, a decision Park called unfair and cited as the reason she would boycott all remaining court proceedings. She has not appeared at her trial since.